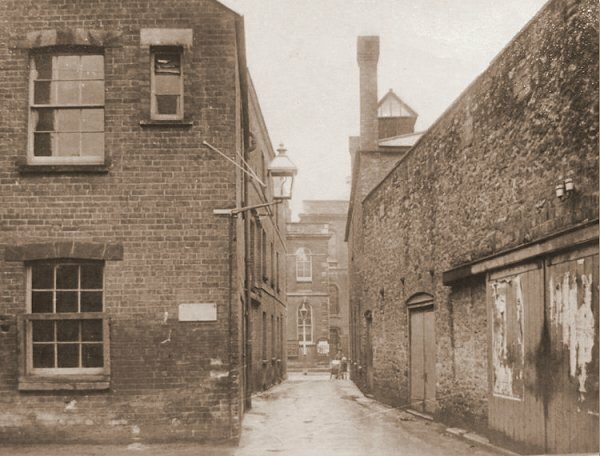 George Court was little more than an alleyway linking High Street with South Street and flanked with ruinous buildings and had something of an ill reputation. The width of its entrance in High Street measured 10' 6" (3.2m) across and at South Street it measured 8' 6" (2.6m). Its overall length was 232' 6" (70.7m). In keeping with other 'courts' of all-but slum housing in Yeovil, George Court was usually home to several poor families at any one time. In the 1841 census there were seven families, a total of 35 people, living in the cramped conditions of the Court including the families of chimney sweep William Hunt, glovers William Hellyar and William Jackson, agricultural labourer George Whittle, police constable James Belbin and labourer William Hill. By the time of the 1851 census, when it was called George's Court, just two families were resident, a total of ten persons. But George Court also had stables, so what with that, the meat market and the cheese market along the western side, the air in the narrow Court must have been quite 'special'. The George Inn in High Street, not to be confused with the later and more well-known (in recent times) George Hotel in Middle Street, was mentioned as early as 1568 in the Churchwarden's Accounts of St John the Baptist, later in the 1664 Rate Book and again in the Portreeve's Accounts for 1669. It is not known how long the George Inn of High Street traded for but was probably closed by the end of the eighteenth century and it is likely that the Three Cups Inn in Middle Street was renamed the George some time afterwards. George Court, however, retained its name even after the passing of the inn. 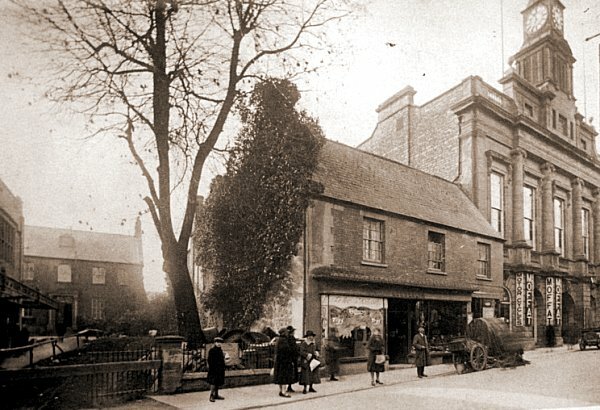 In 1832 the Improvement Commissioners gave notice to the owners to "remove nuisances in George Court" and in 1846 the newly appointed Special Commissioners, created to improve Yeovil's markets and build a new town hall, purchased George Court from its then owner, Michael Cumbrune Davey, as well as other neighbouring properties including the Bell Inn with a view to demolition. The Western Flying Post commented that "by destroying George Court they will get rid of a great nuisance." Nevertheless, despite the Commissioners' best intentions, George Court survived for another eighty years, demonstrating yet again that the wheels of local government are able to grind exceedingly slowly when they want to! The site of the George Inn was occupied by Denner and Stiby's ironmongery business until 1892 possibly in the original George Inn building. At this time the Borough Surveyor's offices were located in George Court having removed from the Town House where the offices had been since the 1840's. After Denner & Stiby vacated the High Street building, it was occupied by Llewellyn's greengrocery and florist premises. This building had rooms that extended over an archway that was the High Street entrance to George Court. 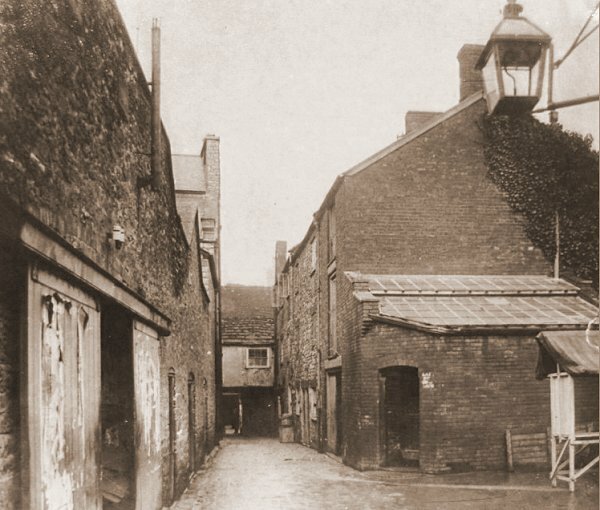 At its southern end, at South Street, it was flanked on the west by the Cheese Market and on the east by the Market House Inn as seen in the last photograph below. George Court, as well as other neighbouring properties including the adjacent Borough House (the former Bell Inn), was finally demolished around 1925 for the construction of municipal offices and King George Street, which was completed by 1928. 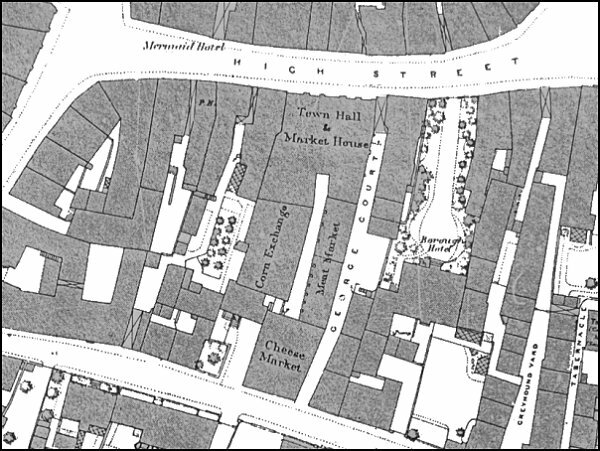 The 1886 Ordnance Survey showing the Town Hall & Market House, the Corn Exchange, Meat Market and the Cheese Market. George Court runs between High Street at the top of the map and South Street at the bottom. 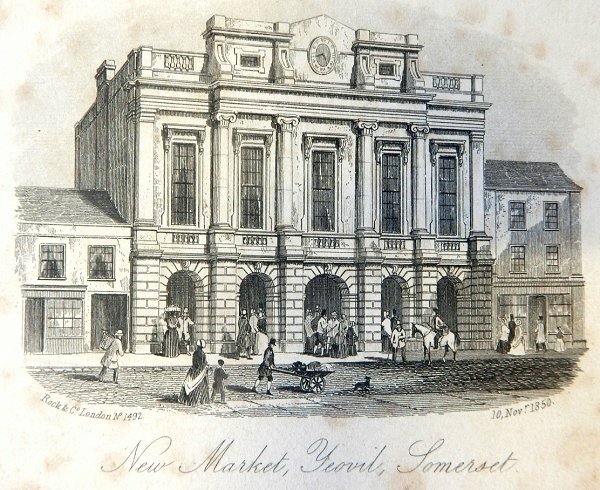 A celebratory sketch dated 1850 of the Town Hall and Market House opened the previous year. The clock, illustrated here in the pediment, was a bit of wishful thinking as the actual clock was not installed until 1864 and even then wasn't set into the pediment as shown here, but mounted in a short tower so that all four faces of the clock could be seen. The High Street entrance to George Court is seen at left next to the Town Hall, under the first floor window of the George Inn seen at extreme left. This photograph (clearly 'touched up' by the photographer) was taken around 1860. 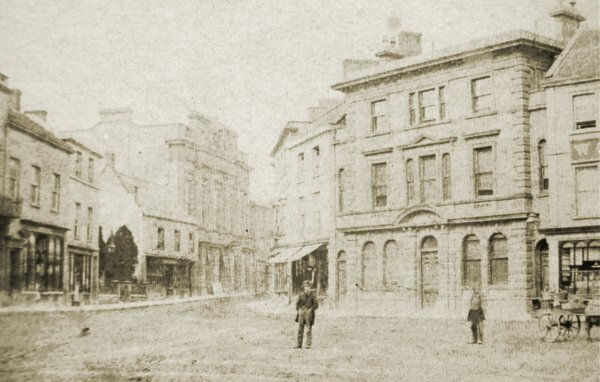 The large building left of centre is the Town Hall in High Street that was built in 1849. Note that the Town Hall lacks the clock tower seen in the next photograph as this was only added in 1864. The two-storey building to its left stands on the site of the George Inn with its first floor projecting over the alleyway known as George Court between the George Inn site and the Town Hall. 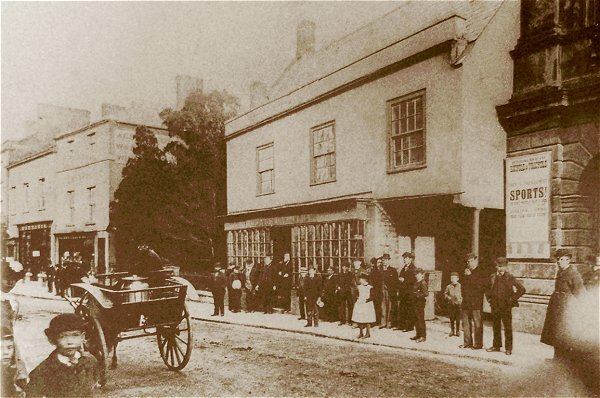 Denner & Stiby's shop photographed in 1883, probably by Henry Stiby who was a keen amateur photographer and left a good record of photographs of Yeovil. Note under the right of the three first floor windows is the entrance to the less-than-savoury George Court. 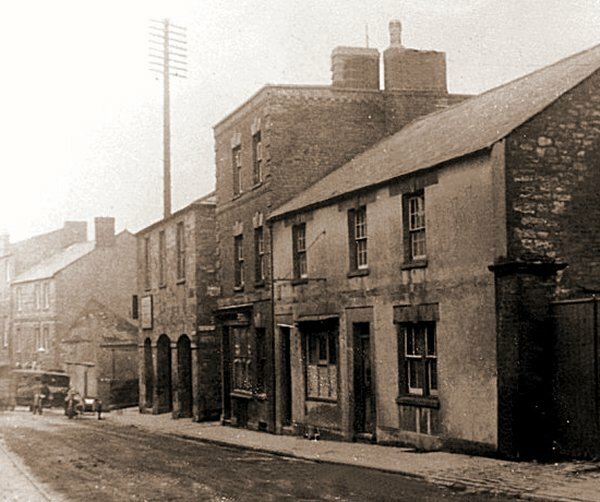 This photograph of High Street, dating to about 1925, shows the building on the site of the George Inn - occupied by Denner and Stiby's ironmongery business until 1892 and then (at the time of this photograph) by Llewellyn's greengrocery and florist premises. Below the right hand window of the three first floor windows was the High Street entrance to George Court. The set-back building at left is the former Bell Inn. The shop was later taken over by the Petters as seen below. 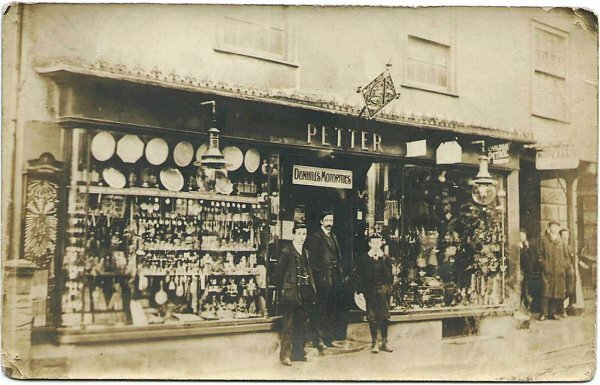 A postcard dated 1905 of Petter's second shop in High Street. The people at right are standing at the entrance to George Court and at extreme right is the first of the arches of the Town Hall. This photograph features in my book 'Secret Yeovil'. This photograph dates to about 1915 and looks north along George Court towards High Street with the meat market at left and slum housing at right. At the end the 'flying freehold' is built over the tiny entrance to George Court. To the right the Court widens, as seen on the above map, towards the Bell Inn or, as was called in 1886, the Borough Hotel. This photograph features in my books 'Yeovil From Old Photographs' and 'Secret Yeovil'. Also dating to about 1915, this photograph looks south along George Court towards South Street and the widening of the Court is now at left. The buildings at the far end are the Newnam Hall and the Baptist church on the other side of South Street. The three-storied building to left of centre is the Market House Inn. The two-storied building to its left is the Cheese Market building with its three arches at ground floor level. Between the two buildings is very narrow South Street entrance to George Court. This photograph dates to about 1910.